In the 2017 World Baseball Classic, the state of Israel who has qualified for the main tournament for the first time, has shocked the baseball world by first upsetting South Korea, 2-1, then defeating the Republic of China, 15-7, and [this from Joshua Sharf on Facebook]: "And Israel holds on to beat the Netherlands, 4-2, and finish pool play 3-0. They'll move on from Seoul to Tokyo for the next [quarterfinal] round." This from Wikipedia: "Israel has competed in the World Baseball Classic since the 2013 World Baseball Classic qualifier round. In 2017 Israel competed at the World Baseball Classic qualifier for the second time, and for the first time qualifying for the main tournament. Based on their 2017 first round performance, Israel has advanced to the second round, and has qualified for the 2021 World Baseball Classic." Israel's good luck charm - "The Mensch on the bench." 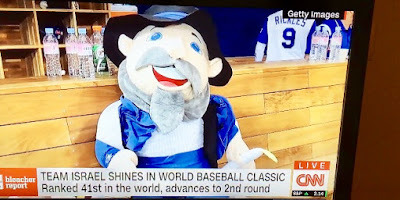 I don't know if Israel will win another game, but for a team that was ranked #41 in the world at the start of the tournament, a team with no Major League Baseball players on it, and a team with 200-1 odds to win the championship, I say just reaching this level, Bravo, Israel baseball!